One autumn day in 1842, a gift of five hens and two roosters arrived at Windsor Castle for the young Queen Victoria. These were not the scrappy little English chickens of the day, but enormous regal creatures carried to Britain by a naval officer returning from the Opium War in China. Victoria was entranced. She hired a royal poultry keeper and ordered a luxurious aviary built to house the exotic birds, which included a private apartment where she and her new husband, Prince Albert, could watch the fowl cavort on the pebbled paths. Marco Polo in the 13th century described huge Chinese chickens with hair like cats that laid massive eggs, but these stories were dismissed as fairy tales. As the West forced China to open its markets, the appearance of such birds in Victorian Britain sparked a frenzy of collecting among the queen’s subjects. It was called, simply, "The Fancy." A single bird could sell for the equivalent of $10,000 today. Like Holland’s 17th-century tulip mania, the wild speculation inflated a bubble that soon burst. But unlike tulip mania, the peculiar fad continues to affect the lives of billions of people every day. Victoria’s obsession led to the creation of what is now humanity’s single most important source of protein, the modern chicken. Today it is the world’s most ubiquitous bird—there are more than 20 billion at any given time on Earth--and its meat and eggs are an essential element in the global food chain. In the land of the hamburger, Americans now eat more chicken than beef. The rest of the world is quickly copying our way of mass-producing chicken meat and eggs to feed the hungry millions in burgeoning cities from Latin America and Africa to China. Throughout most of history, however, chicken was not synonymous with a meal. In the West, it first was a treasured creature fit only for kings. Four millennia ago, traders from the Indus River civilization in what today includes Pakistan and western India brought the domesticated bird to Ur, the cosmopolitan city in Mesopotamia. Ur, legendary home to Abraham, was the largest and wealthiest urban center on Earth. The ruler kept the chicken or a statue of its likeness in his palace menagerie, the world’s first recorded zoo. Five hundred years later, Egyptian pharaoh Thutmose III invaded what is now Syria and Iraq. Among the booty he brought back were birds said to lay eggs every day—a likely reference to the chicken. Our earliest likeness of the bird is a charming 3,000-year-old drawing on a piece of pottery found in Egypt’s Valley of the Kings. A thousand years later, ancient Persians and classical Greeks alike considered the chicken sacred to the gods, a link between heaven and earth. During the days of the Roman Republic, military leaders studied the birds’ behavior to determine if they should go to war or sue for peace, while later Christians placed it on top of their churches. Chickens were also veritable two-legged medicine chests, their various parts capable of curing everything from bedwetting to burns. And from Confucian China to today’s Appalachia, men used it for cockfighting—perhaps the world’s oldest sport after boxing. For millennia, the bird symbolized everything from spiritual awakening to sexual prowess. There is no other animal that has served humans in so many versatile ways. But cheap chicken was not on the day-to-day menu of early Victorian Britain. When the Asian fowl arrived, the British bird was more expensive and less desirable than beef, pork, or even goose and turkey. “People of narrow income, if living in town, can seldom afford to put any on their table,” one contemporary noted. Bob Cratchit bought the economical goose, while the repentant Scrooge in Dickens’ 1843 "A Christmas Carol" sought the prize turkey. London by then had surpassed Beijing as the world’s largest city. Strikes and revolts by workers protesting wage cuts and the rising cost of basic staples shook the government. It was called the Hungry Forties. The British cleric and statistician Thomas Robert Malthus had warned that disaster loomed as the population grew and food supply levels remained stagnant. Soon the potato blight began to ravage Ireland, and its horrors seemed a harbinger of more dreadful famines to come. A cheap and plentiful supply of protein was essential for economic prosperity and civic peace. Breeders in Britain and the United States discovered that by crossing the birds from the East with those from the West, they could create new and much more productive birds. One critic dismissed the Plymouth Rock, a mixture of Asian and English varieties first displayed in Boston in 1849, as a “mongrel of little worth.” It took a full century for the new varieties to become an essential and inexpensive part of the Western diet. It was combination of technological and business innovation that made the chicken ultimately triumph over its rivals. Electric incubators and electric lights, which fooled chickens into producing eggs year round, made it simpler and more profitable to raise the birds. Poor rural women in the American Midwest and South made quick use of railroads to feed the growing market in booming cities like New York and Chicago. World War I diverted beef and pork to the troops, and Americans were encouraged to keep backyard chickens as an alternative. And the government approved the shipment of live chicks by mail, which spawned hundreds of hatcheries around the country. Vast chicken houses began to replace to small coops, and processed grain edged out the dinner scraps tossed out the backdoor. After World War II, the largest food retailer in the United States—A&P—sponsored the equivalent of the Manhattan Project for poultry. This national Chicken of Tomorrow contest produced a big-breasted bird that could grow fast on little feed. The invention engendered new business practices. Companies like Tyson Foods pioneered vertical integration, buying up hatcheries and feed factories as well as broiler houses. The cost of chicken plummeted, and Americans are on their way to consuming on average 100 pounds of the meat a year—and that doesn’t count the eggs. The rest of the world, with few exceptions, is eagerly copying the American methods for making cheap chicken. Malthus did not count on the bird to help rescue the urban masses from starvation. This miracle of science and engineering, however, has enormous costs largely hidden from customers. Processing chicken is among the lowest paid, dangerous, and dirtiest work in the country today, while pollution from the vast amount of waste generated by the industry poses daunting environmental challenges. And then there’s the industrial chicken itself, living a short and brutish life if a broiler, and a longer and often more painful life if a layer. Under U.S. law, it is not even considered an animal if it is grown for food. If there is an animal that doesn’t get respect, it is today’s chicken. Victoria, an inveterate animal lover, surely would not be amused. The bird’s emergence as a critical part of our food supply is no doubt a testament to human ingenuity. But we might pause, if only between bites of a chicken burrito, to ponder the role of this once-royal and now frequently belittled creature in making possible our fast-paced urban world. 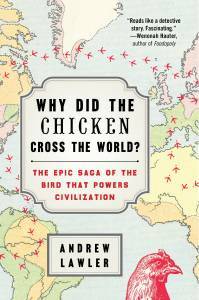 Andrew Lawler is the author of "Why Did the Chicken Cross the World? : The Epic Saga of the Bird that Powers Civilization." Andrew Lawler is author of "The Secret Token: Myth, Obsession, and the Search for the Lost Colony of Roanoke."